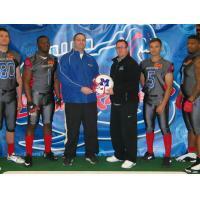 MARION - OhioHealth has become the official health care provider for the Marion Blue Racers, central Ohio's only professional indoor football team. "Partnering with the Marion Blue Racers is an exciting opportunity for OhioHealth," said Jodi Norton, director of marketing communications for OhioHealth Marion General Hospital. "OhioHealth's commitment to providing amateur and professional athletes with expert sports medicine and orthopedic care is strong. That's why athletes of all levels -from high school, to college, to professional sports - turn to OhioHealth to provide team physicians and athletic trainers. Our expertise in sports medicine helps athletes recover from sports-related injuries and perform at their best before, during and after their games. We're thrilled to be able to bring this same level of support to Marion." For the 2015 season, OhioHealth will provide athletic training services, team physicals, game-night physician coverage, and support services such as concussion baseline testing, sports nutrition counseling, sports psychology services, follow-up care after injuries, and more. The agreement elevates OhioHealth's previous sponsorship and support of the Blue Racers. "OhioHealth is a remarkable community leader in health and wellness, and we are proud to have them as our official health care provider," said LaMonte Coleman, CEO for the Marion Blue Racers and CEO of Run 42 Sports Group LLC. "This affiliation makes it possible for our players to receive top-notch care, on and off the field, during the season." "In an industry where you rely on your body to perform, it's important to have the best, and OhioHealth is it," Coleman said. "We are fortunate to have them here in Marion. They understand the intense demands this sport can put on your body. We trust and rely on them." For information about the Marion Blue Racers, including their 2015 schedule, visit blueracersfootball.com.